Keep The Spirit of '45 Alive Day ceremony was held at Veterans Memorial Park in Mchenry Sunday afternoon. 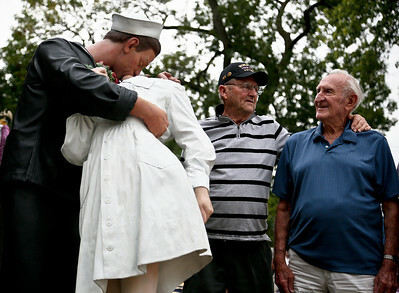 Josh Peckler - Jpeckler@shawmedia.com World War II veterans Leo Carvis of Woodstock (left) and John Babut of Mchenry look at the “Kiss Seen Around The World" statue after helping unveil it during a Keep The Spirit of '45 Alive” Day event held at Veterans Memorial Park in Mchenry Sunday, August 12, 2012. The event honored World War II veterans who live in the Mchenry County area. Josh Peckler - Jpeckler@shawmedia.com Dan Aylward of Mchenry holds a American flag as he waits for the start of a "Keep The Spirit of '45 Alive” Day event held at Veterans Memorial Park in Mchenry Sunday, August 12, 2012. 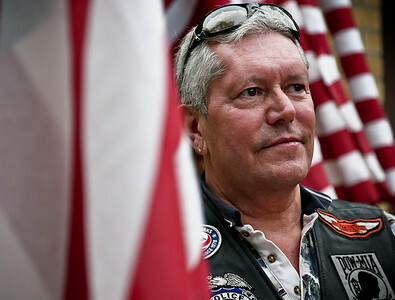 The event honored World War II veterans who live in the Mchenry County area. 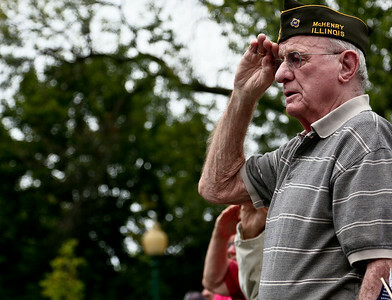 Josh Peckler - Jpeckler@shawmedia.com World War II veteran Bill Abbink of Crystal Lake salutes the American flag during a "Keep The Spirit of '45 Alive” Day event held at Veterans Memorial Park in Mchenry Sunday, August 12, 2012. The event honored World War II veterans who live in the Mchenry County area. 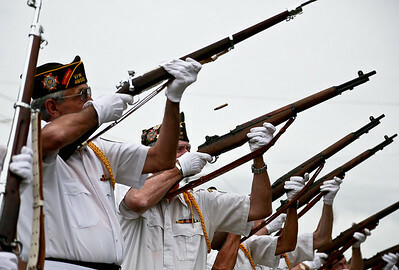 Josh Peckler - Jpeckler@shawmedia.com A spent shell casing flies out of a rifle after members of VFW Post 4600 in Mchenry fired off their rifles during a "Keep The Spirit of '45 Alive” Day event held at Veterans Memorial Park in Mchenry Sunday, August 12, 2012. The event honored World War II veterans who live in the Mchenry County area. 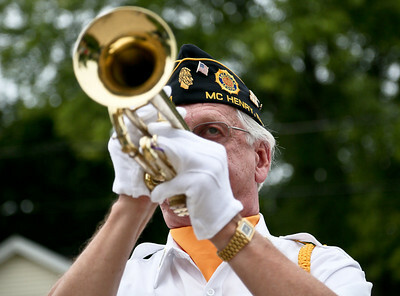 Josh Peckler - Jpeckler@shawmedia.com Ron Bykowski of Mchenry performs "Taps" on a trumpet during a "Keep The Spirit of '45 Alive” Day event held at Veterans Memorial Park in Mchenry Sunday, August 12, 2012. The event honored World War II veterans who live in the Mchenry County area. 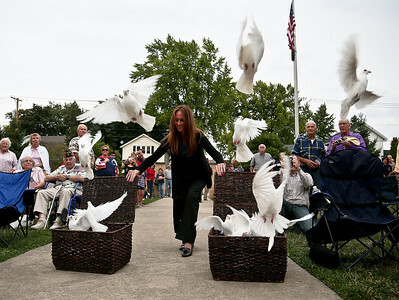 Josh Peckler - Jpeckler@shawmedia.com Owner of White Dove Release Michaleen Nikolich releases doves during a Keep The Spirit of '45 Alive” Day event held at Veterans Memorial Park in Mchenry Sunday, August 12, 2012. The event honored World War II veterans who live in the Mchenry County area. Josh Peckler - Jpeckler@shawmedia.com People turn towards a giant American flag that was hanging from a Mchenry Fire Department ladder truck during a "Keep The Spirit of '45 Alive” Day event held at Veterans Memorial Park in Mchenry Sunday, August 12, 2012. The event honored World War II veterans who live in the Mchenry County area. 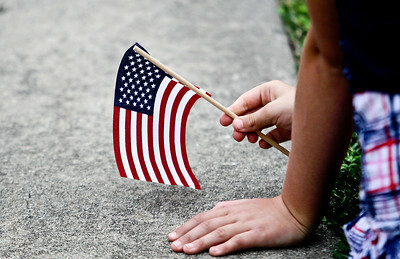 Josh Peckler - Jpeckler@shawmedia.com A young girl holds a American flag during a "Keep The Spirit of '45 Alive” Day event held at Veterans Memorial Park in Mchenry Sunday, August 12, 2012. The event honored World War II veterans who live in the Mchenry County area. 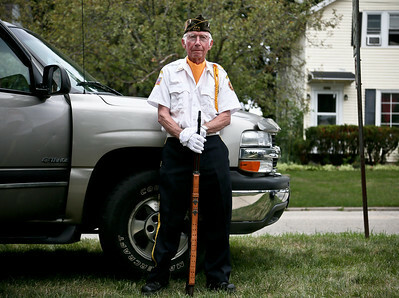 Josh Peckler - Jpeckler@shawmedia.com Korean War veteran Charles Mathey of Woodstock leans against a truck with his rifle as he waits for the start of a "Keep The Spirit of '45 Alive” Day event held at Veterans Memorial Park in Mchenry Sunday, August 12, 2012. The event honored World War II veterans who live in the Mchenry County area. Josh Peckler - Jpeckler@shawmedia.com Valerie Kennebeck of Johnsburg hands out American flags to veterans and their families during a "Keep The Spirit of '45 Alive” Day event held at Veterans Memorial Park in Mchenry Sunday, August 12, 2012. The event honored World War II veterans who live in the Mchenry County area. 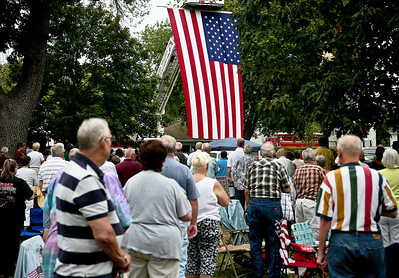 People turn towards a giant American flag that was hanging from a Mchenry Fire Department ladder truck during a "Keep The Spirit of '45 Alive” Day event held at Veterans Memorial Park in Mchenry Sunday, August 12, 2012. The event honored World War II veterans who live in the Mchenry County area.